Recently H&M released its annual sustainability report for 2014. The document mentions in detail how the company is implementing more eco-friendly practices in its supply chain and stores to reduce the harm it causes the environment, as well as its efforts on a variety of social welfare issues such as gender equality and poverty alleviation. H&M manufactures at least 600 million items each year and operates more than 3,200 stores in 55 countries. If you include its subsidiary brands, such as COS, that number jumps above 3,500 stores, and the company is expanding its locations by 10% to 15% each year. To operate those stores—besides manufacturing and shiping the clothes —requires a staggering amount of resources, from energy-hungry cotton to electricity, oil, and water . Even if H&M manages to mitigate its environmental footprint slightly from one year to the next, its business continues to grow, and that footprint remains enormous—and far from sustainable. H&M Conscious is the name of their work for a more sustainable fashion future. It’s consisting of seven commitments and is built on passion, long-term thinking and teamwork. 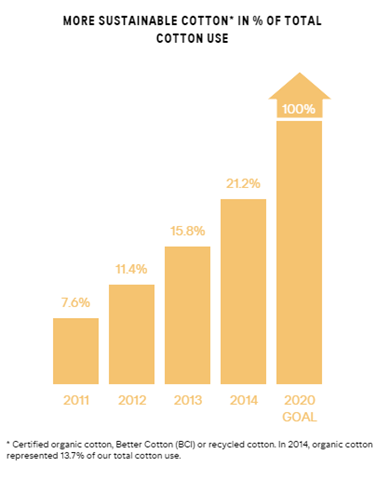 H&M seeks to make seven commitments towards sustainability and measures its performance towards those commitments. H&M uses about 21% of total cotton consumed in the form of Organic Cotton, BCI or recycled cotton and is supposed to be No. 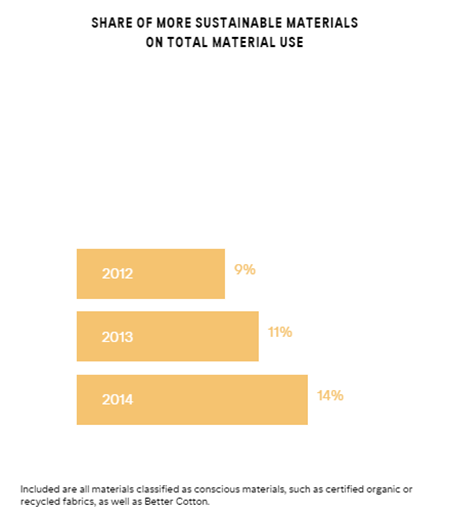 1 user of organic cotton according to textile exchange report of 2013. About 13.7% of all its materials consumed are in the form classified as conscious materials. H&M seeks to reward its responsible partners and seeks to make them more committed towards their workers and encourage role model factories. It seeks to have about 550 suppliers with fair living wage system by 2018. One of the criteria that H&M takes for measuring being ethical is to employ more of female employees – though not a very right measure for the same. 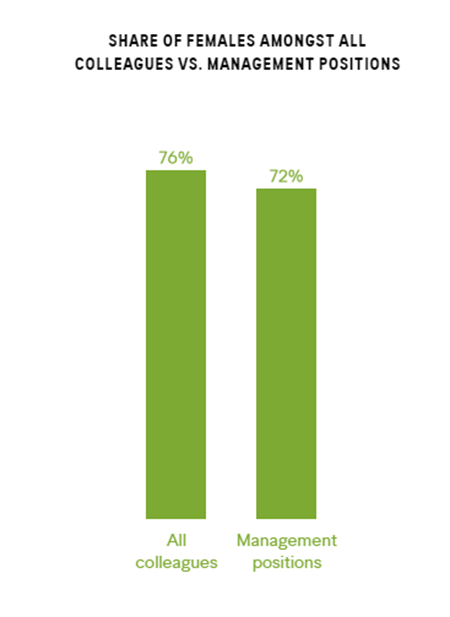 About 76% of their workforce is female and 72% of management positions are being held by them. 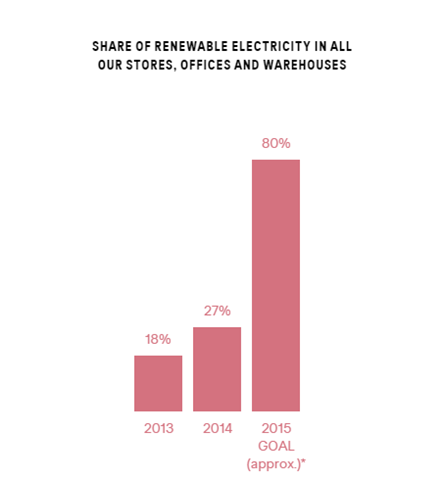 Renewable energy is sought to be used in all stores, offices, warehouses of H&M (*100% in all markets, where this is feasible and renewable electricity is credibly available. This is currently not the case ,for example, in China or Peru). Electricity use per sq. mtr of H&M brand store is sought to be reduced by 20% in 2015 compared to 2007 levels. Anyone can drop unwanted clothes at H&M and they will try to give it a new life. The goal is to create a closed loop where unwanted garments are recycled into new creations. Currently they claim to blend in about 20% recycled fibres without any loss of quality or longevity. 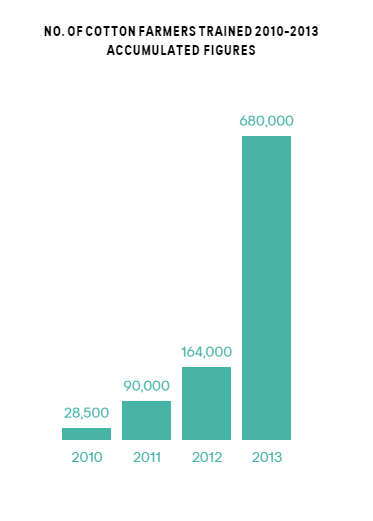 About 7600 tons of garments were collected for reuse or recycling through their in store garment collection programme. 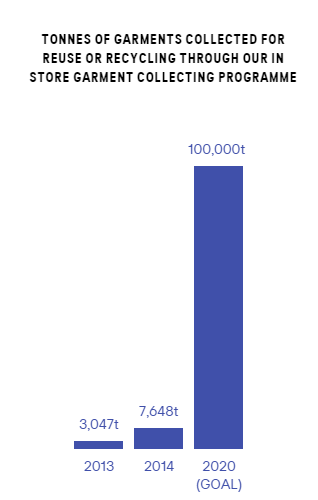 The target for 2020 is 100,000 tons – a very ambitious one indeed. H&M seeks to educate its suppliers on water conservation and compliance with waste water quality requirements. 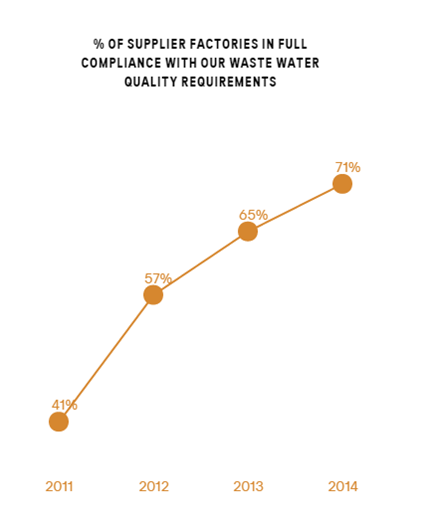 Their internal guidelines on waster water quality are met by about 71% of total suppliers in 2014. Besides other activities of community involvement, H&M trains cotton farmers to do better crops. The numbers claimed are quite high ! 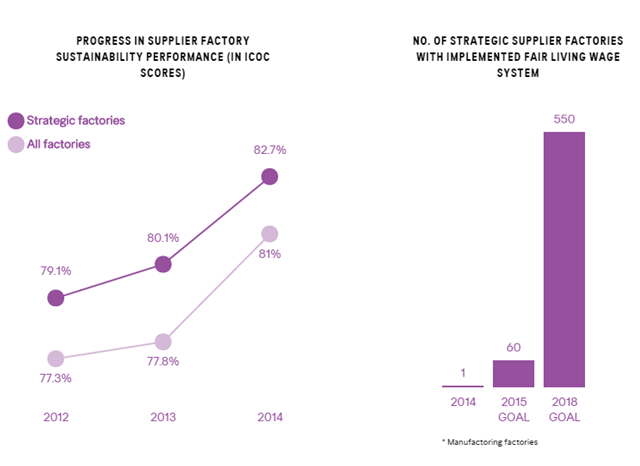 While the report makes it clear that H&M is doing a good deal to lessen its impact, it is also a fact that the goal and fast fashion are inherently at odds. By its nature, fast fashion is a volume business, which is exactly what makes it a big strain on the planet. The proponents of fast fashion will try to always sell more and there is inherently the conflict with sustainability. 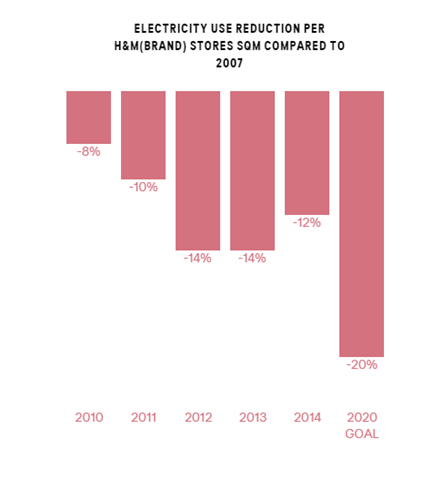 H&M acknowledges that the sheer quantity of resources it consumes is a serious problem. In US alone about 10.5 million tons of clothes end up in landfills each year. Even if H&M ensures a large part of its clothing is organic or BCI cotton , still the landfills will be filled unless the garment recycling process becomes much more widespread and is taken up by a larger number of brands and retailers. H&M’s target of getting 100,000 tons of garments for reuse in 2020 will be still less than 1% of garments going to landfills in US alone. Currently it is about 0.2% of its own garments that are being recycled. The problem is endemic and needs industry wide awareness. However, still it is commendable that H&M has taken a lead which can offer example to other larger entities in this business.